This winter I suffered the driest skin of my life. It's impossible to overstate how dry my skin was. Damned Minnesota winter air! On top of that, no humidifier in the world was strong enough to truly moisten the air in my ultra-dry, Arizona-like apartment. Ouch, ouch, ouch. Who knew air could be so painful? 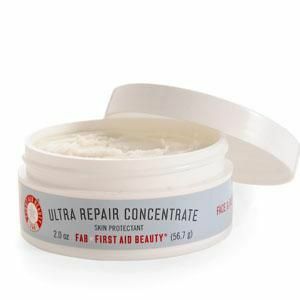 F-A-B's Ultra Repair Concentrate was the only product able to keep my skin feeling hydrated for more than 10 minutes at a time. It creates a barrier on your skin to keep it from drying out due to harsh air conditions. I got it at Sephora (gurl, I want my VIB points), and luckily for my pocketbook one jar goes a *long* way, and is priced at under $30.